In 2013, the project team was invited to provide a case study on the ecological enhancement activity at Shaldon for the forthcoming Water Framework Directive Mitigation Measures Manual, demonstrating a direct policy application of our research findings. We were also invited to participate in the Joint DEFRA-Environment Agency Flood Risk R&D workshop on ‘Working with Natural Processes’. Our collaborative work with the Environment Agency resulting from this research, which led to the development of new guidance for ecological enhancement of hard coastal structures, was awarded with an 'Environment Agency Evidence award' for excellence in working externally. The panel was formed by the Chief Executive of the EA alongside representatives from Defra, the British Geological Society and Natural England. Our involvement with the design and testing of ecological habitat enhancements as part of the Environment Agency's Shaldon and Ringmore Tidal Defence Scheme has also been rewarded, with the overall scheme winning an Environment Agency Project Excellence Award for 'Exemplar Safety, Health and Environment Performance'. Only four national awards of this level are awarded each year, and judges were particularly impressed with the work to create niche habitats in the flood walls. Larissa Naylor and Martin Coombes were invited to present the paper 'Reconceptualising the role of organisms in the erosion of rock coasts' (produced in collaboration with Heather Viles) at the 42nd Annual Binghamton Geomorphology Symposium in Mobile, Alabama USA. 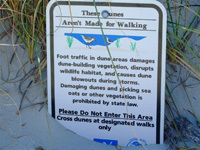 Dr Coombes presented the paper at the conference (with an audio introduction from Dr Naylor), which included an excellent field trip around Mobile Bay and Dauphin Island (still recovering from Hurricane Katrina, see photo), and was attended by more than 50 biogeomorphologists and ecologists interested in the interactions between organisms and the physical environment. The presentation included data collected during the 'coastal defences and biodiversity' project, and discussed how organisms alter rock properties and erosion processes on rocky shores. Details of the paper can be found here. The coastal defences and biodiversity project has been shortlisted for the University of Exeter Impact Awards under the 'Outstanding Regional Impact' category. This is in recognition of the influence of the work on regional (and national) coastal defence practices and the project team's commitment to engagement with industry, government agencies and the general public. Winners will be announced on the 7th December. The project team have produced guidance on the inclusion of ecological enhancement in the design and planning of coastal structures for the Environment Agency – they officially launched the guidance at the EA via a series of face:face seminars and webinars in September 2011. We helped write a ‘Good Practice Note’ for Environment Agency staff, based on our experiences applying our research at Shaldon, Devon. A new follow-on project has commenced with funding from the Esmée Fairbairn Foundation. The project will run for two years, undertaken by the University of Exeter in collaboration with the universities of Oxford and Plymouth and the Marine Biological Association. Details of the project can be found here. 7. Expanding our network with Portland Port Authority. A Knowledge Exchange between the University of Exeter and Portland Port has been undertaken to provide guidance on the potential for ecological enhancement in ports and harbours. As well as a guidance document, produced in collaboration with Treweek Environmental Consultants, a rapid appraisal of the ecological communities currently supported by rock breakwater structures at Portland was also undertaken in collaboration with local ecologists. Armed with an interactive display, the team explained our research to the general public in Ilfracombe. 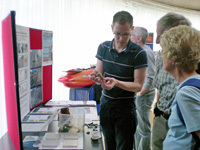 Over 40 people visited our stall and asked questions about our research and what we did at Ilfracombe. Dr Naylor gave an invited lecture to 75 delegates at Falmouth Port’s Sustainable Ports Day designed to bring together all of the organisations involved in managing Falmouth’s estuary. Please contact us if you would like advice on the design and testing of habitat enhancement for other coastal defence structures.